Now, he says he realizes the potential implications of this experiment include fighting diseases, eradicating hunger and reversing climate change — all things that could directly impact his family both in Arizona and India. “Admittedly, I'd say a solid 20% of my motivation for going into biotechnology was to make stuff glow," Favre said. "I never quite forgot how cool a lot of what I studied was from a purely childish perspective." Drawing on his experience with science’s “cool” factor, Favre, graduating with a Master of Science in molecular and cellular biology from the School of Life Sciences, continues to find ways to inspire others by making science education available to a wide range of audiences. His favorite means of communication is the Phoenix Comic Fest, during which he explained science to an auditorium of more than 100 people by describing different types of bacteria as if they were comic book characters. Question: Why did you choose Arizona State University? Answer: ASU's mission of inclusion and advancing research of public value was probably the biggest reason I chose ASU. There are plenty of prestigious universities out there that have admission rates in the single digits and spend their research dollars getting way too deep in the weeds, but I saw this approach to higher education to be completely broken. Problems like disease and poverty still cause immense suffering around the world, our climate continues to deteriorate, and fewer and fewer people are able to afford an education. If the secret to saving the world was admitting only a handful of students and limiting a school's research output to discoveries of insignificant value to the general public, these problems wouldn't continue to exist. ASU's willingness to include those who might not have had a chance to pursue higher education fosters a phenomenally creative, inclusive and positive community that would be hard to find elsewhere. ASU gives students the tools they need to reach their fullest potential, and because I wanted to be in a community of these innovators, creators and dreamers, I couldn't think of a better university for me to choose for both my undergraduate and graduate degree. A: Before starting my senior year of my undergraduate career at ASU, I was freaking out over how hard I had heard my major's capstone course was. I knew my current major was a perfect fit for my interests, but I got so hyped up on the horror stories that I almost switched my major on the grounds of being too afraid to take the capstone course. I had the paperwork all filled out and ready to go, and I stopped by my mentor's office to let him know of the change. Dr. Hugh Mason — the chair of my honors thesis committee, the chair of my MS committee and the first professor whose class I took after switching into my new major — was not enthused. I frantically told him that I had figured that I would fail if I took the course and that I needed to switch majors, but in the middle of my paranoid ranting, he stopped me and calmly, but firmly, asked me why I thought I would fail. I began to explain, but he immediately asked if I was switching because of what everyone else had said about the course. I sheepishly agreed, and he told me to quit worrying about what everyone else was saying; that was their problem! It was a simple instruction, but it snapped me out of the frenzy I was in and brought me back down to Earth. If not for Dr. Mason's advice, I might have ended up making myself miserable by leaving a program that I was clearly incredibly satisfied with. His advice has continued to help me avoid worrying too much over things I cannot control, like the opinions of others, something I believe has made me a stronger, happier person. A: Take care of your mental health. Stress is an unavoidable part of both undergraduate and graduate studies, but it's important to manage your stress in a healthy way. Make sure to hold on to, or rediscover, the interests and passions you had before you started school. There's more to you than your major! There are tons of studies out there that demonstrate how good being in nature can be for your mental health, and getting out of the Valley of the Sun to see the monumental wonders that litter this state can really bring a new, healthier perspective on life — some of my best ideas to problems that were stressing me out came when I was breathing the fresh, cool mountain air in Pinetop and Flagstaff. A: There are so many beautiful spots on the Tempe campus, but my personal favorite has always been Hayden Library. Whether it was getting up at 3 a.m. to cram for an immunology exam, heading down to the basement to grade a stack of papers, or showing friends from that school down south the Territorial Cup, Hayden has always been a quiet place for me to escape to when I need to get focused. It helps that there aren't any windows to the outside world in the sub-basement, which helped me study for way longer than if I had realized how long I had been down there. When it really became crunch time — see: organic chemistry finals — I could rely on the sub-basement's thick layers of concrete to make my phone stop receiving calls and texts, and because so many of my classmates would also be cramming down in Club Hayden, we could actually get a ton of work done! I know this will sound nerdy, but Hayden was the enzyme that catalyzed my transformation from a lazy, unproductive procrastinator into a studious, efficient crammer whenever I needed it most! 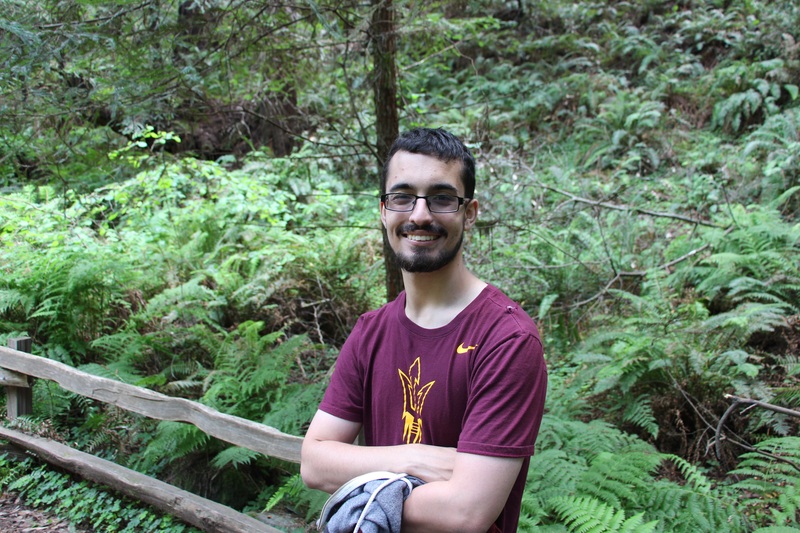 A: I plan to stick around at ASU to get a graduate certificate in Scientific Teaching in Higher Education. I feel like many professors, despite clearly and deeply caring about their students' success and happiness, are underprepared to be in a teaching role. Because I want to one day become a professor, I want to be able to offer my students the highest-quality teaching possible, and since the Teacher's College and School of Life Sciences here at ASU are outstanding, enrolling in a program administered by both designed specifically to improve the quality of undergraduate biology education seemed like a great thing for me to do! After that, I will start a PhD to continue on my track to becoming a professor. A: I would tackle the issue of $40 million somehow not being enough money to do much of anything for a sustained period of time (e.g. decades) in science. It's absurd how expensive it is to do science! I would start a PAC to elect scientists to public office across the United States, including myself. These scientists would then work their way up the federal ladder until they were either the heads of institutions like the FDA, NIH, NSF and the Department of Education or on Congressional committees on all subjects. Eventually one of us would be elected president — hopefully me — some of us would be appointed to the supreme court, for the JD-PhDs among us, and plenty of us would be in Congress. Scientists would be represented at all levels of government. We would then work to implement comprehensive reform to lower the cost of doing science and pursuing higher education so that both stop being so incredibly inaccessible to the general public. A: I joined the SOLS E-Board and worked on improving the mental health resources available to the school's graduate students. We found that SOLS graduate students, the people who TA'd my undergraduate classes, the people who made me want to be a biologist, the people who gave me their best on a daily basis to help me feel included, were under unacceptably high levels of stress. The E-Board designed programs to help students de-stress, like monthly mental health seminars and biweekly support groups, and we started getting some attention at the college and universitywide levels. The SOLS E-Board's mental health improvement proposal was circulated among the heads of different departments, schools and colleges at ASU, and it started a very necessary conversation about the mental health of graduate students. I was incredibly happy and proud to have been a part of that movement, and I fully intend to keep the ball rolling by continuing to push for improved access to mental health resources for graduate students even after I leave ASU.